Welcome to Guitar Tunes, the ad-free version of Guitar♫. Learn the notes of the guitar using our interactive note chart, or tap and play animated songs with music notation or TAB. The guitar fretboard lights up in time with the music to show you which note to play. Just getting started? Select Practice Mode to choose your own tempo. Choose authentic acoustic or electric guitar sounds recorded from live guitars in our own studio. Please note: To strum chords, turn off multitasking gestures in device settings if applicable. 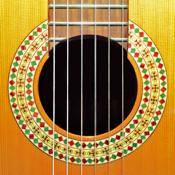 Guitar Tunes includes 8 additional custom fretboards that may be unlocked. Fretboards are unlocked by chance every so often at the end of a song. Are you lucky? All you have to do to unlock fretboards is keep playing. Once you unlock a fretboard, it is saved for you within the app settings. Thanks for playing! We hope you enjoy Guitar Tunes!